Whether just beginning college or approaching graduation, the Center for Career Development can help you explore majors and careers, seek internships and develop professional and job search skills. The center is also here to help you prepare for future success either in assisting with your job search or by pursuing advanced degrees. We have many offerings throughout the year to assist in the successful transition from classroom to the workplace. These programs will help you gain experience, secure a job and grow as a professional. Career Exploration: Figuring out what career path to take can be confusing. Learn what you can do with a major. Career-Related Experiences: Internships, part-time work and volunteering are excellent ways for you to gain valuable experience, learn about careers and start to network with professionals. We can assist you in finding these opportunities. Job Search: We offer one-on-one, individual career counseling to meet your individual needs. This professional guidance provides resume and cover letter critiques, mock interviews, interest assessment testing to help explore career opportunities and clarify personal goals, job search preparation and job fair information. Professional: We facilitate lifelong career management by helping you develop the professional skills necessary to become contributing members of the workplace, community and world. Explore this website for information, events and resources. Current students and alumni can schedule a one-on-one meeting with a career development professional. 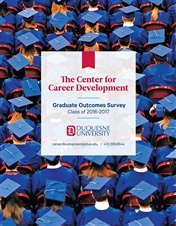 The Center for Career Development prepares students to pursue successful and meaningful careers by offering innovative career planning, job search, and employment resources. We facilitate lifelong career management by helping students develop the necessary professional skills to become contributing members of their workplaces, communities, and world. The Center for Career Development creates partnerships by serving as a central link among students, faculty, employers, and alumni. Integrity to uphold the ethical standards of Duquesne University and of the career services profession as defined by the Duquesne University Mission and the National Association of Colleges and Employers. Respect to act with a spirit of service and demonstrate kindness, compassion, and consideration towards all. Learning to promote student development by actively engaging students in a self-directed career management and job-search process. Excellence to exceed the expectations of our student and employer clients in all interactions and provide the highest quality programs and services. Stewardship to encourage students to identify, develop, and apply their skills and talents in order to make a positive contribution to their workplaces and communities. The Center for Career Development happily supports the community in which we live. In the office - Staff members participate in Jeans for Charity program. We each donate $50 every six months to a charity chosen and agreed upon by staff members which allows us to wear jeans on Fridays. In addition, we wear a tag displaying the charity's logo and also display a sign in our office for visitors to learn about the program and charity. We have donated to North Hills Community Outreach, Alzheimer's Association, Gilda's Club, and Global Links to name a few. On-site - Each year we partner with a charity and get out into the community. We're amazing with plasterboard and paint, as well as hammers and drills! But we're also adept at wrapping gifts during the holidays and we can tie a mean bow! We're happy to meet with you to discuss all your questions related to your career plans, from A-Z. Both students and alumni make appointments in Handshake. Monday - Friday: 1 - 4 p.m.
Tuesdays and Wednesdays until 5:30 p.m.
For an extended meeting, please make an appointment through Handshake. People in the know offer inside info on careers and how to achieve your goals. Check out these videos! Volunteer opportunities through student organizations and upcoming events are listed on Campus Link.